Natasha has over 10 years experience in the technology, health supports and market research sectors. Her work spans project management, community engagement, research and evaluation in Australia and Canada. A growing interest in disrupters in the health and wellbeing space led to a connection with Bridge for Health’s co-founders and the opportunity to play a key role in the creation of the cooperatives business structure. 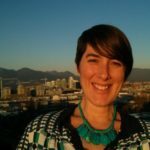 Natasha is a founding member and co-Chair of Bridge for Health, as well as Research Analyst for Wellbeing at UBC. At UBC Natasha provides strategic and evaluation support for programs and projects that focus on wellbeing of community members. In the technology space Natasha contributed to the development Tyze Personal Networks, a care coordination platform. With a focus on research, community engagement and product management Natasha played a key role engaging users, developing resources and making strategic product improvements. Natasha has a Bachelor of Social Science (RMIT University, Australia) and Graduate Certificate in International Management (Capilano University, Canada).